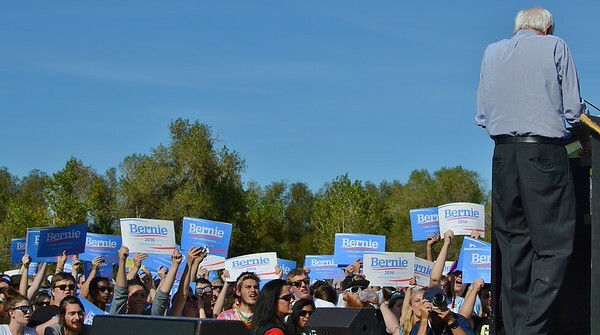 Images of a campaign rally for Senator Bernie Sanders, candidate for the Democratic Partys nomination for President. Including images of rally attendees with signs and banners and campaign volunteers. Also includes images of Senator Sanders from behind, speaking from a podium. 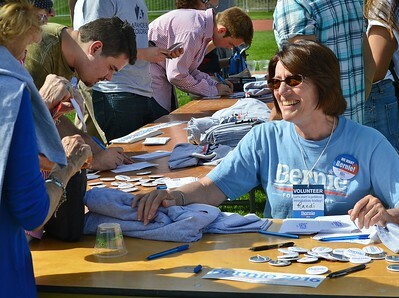 Smiling Bernie Sanders volunteer sitting at a table, selling shirts and buttons. 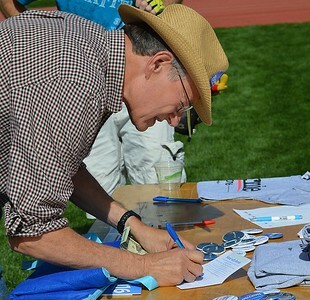 People in background signing pledge cards. 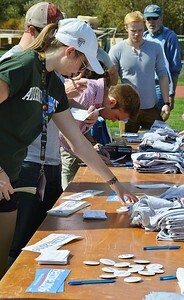 Bernis Sanders rally attendees looking at shirts, buttons and bumperstickers on a table. 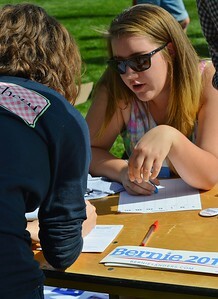 Young Bernie Sanders volunteer looks on as other women fills out a donation card. 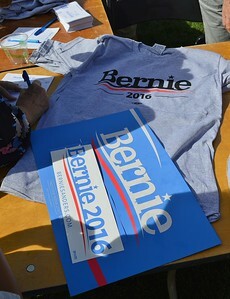 Bernie Sanders, t-shirt, sign and bumpersticker lying on a table. 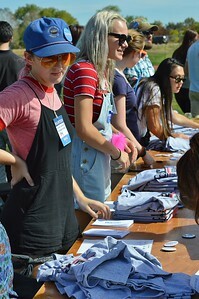 Grouop of young volunteers for Bernie Sanders standing behind a table with piles of t-shirts on it. 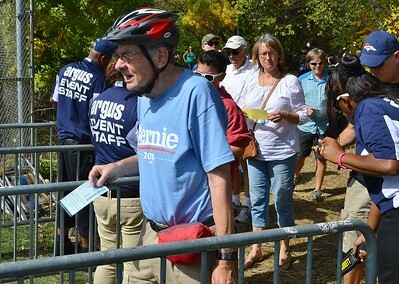 Older man, wearing a bicycle helmet and Bernie Sanders t-shirt, holds a ticket in his had as he enters the campaign rally, others in line behind him. 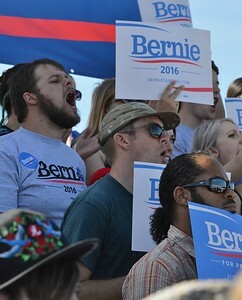 Bernis Sanders supporters at rally, shouting and raising signs. 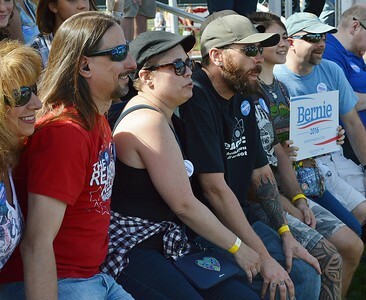 Row of Bernie Sanders supporters sitting together at a rally, some wearing buttons and holding signs. Large group of Bernie Sanders supporters standing on bleachers, many holding signs and wearing t-shirts and buttons. 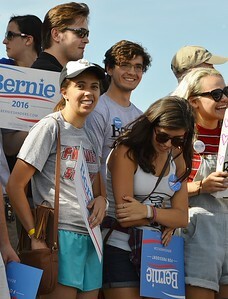 Group of young Bernie Sanders supporters with signs. 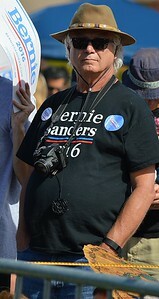 Man at Bernie Sanders rally, wearing camera around his neck, also wearing Sanders t-shirt and buttons. 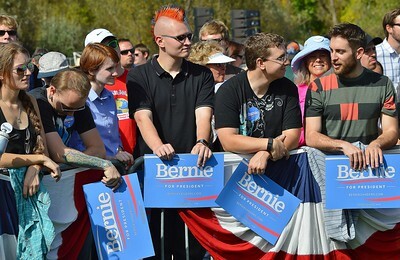 Young man with orange mohawk haircut, holding Bernie Sanders sign, others next to him with signs. All standing in front od fence with red, white and blue bunting on it. 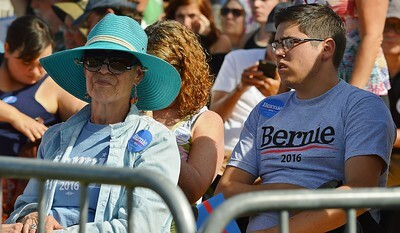 Older woman and young man wearing Bernie Sanders t-shirts, sitting at rally. 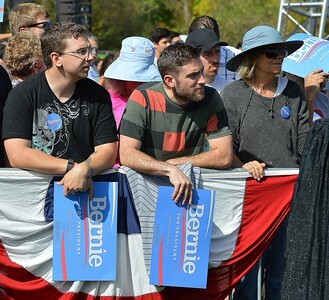 Two young men holding Bernie Sanders signs lean on fence with red, white and blue bunting on it. 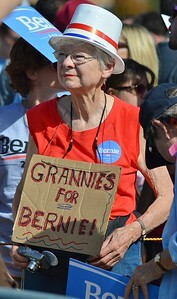 Bernie Sanders supporters holding signs at rally. 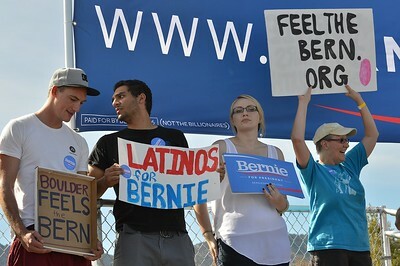 One sign says "Latinos for Bernie", another "Boulder Feels The Bern". Woman holds sign over her head that says "Feel The Bern.org, other rally attendees on both sides of her. 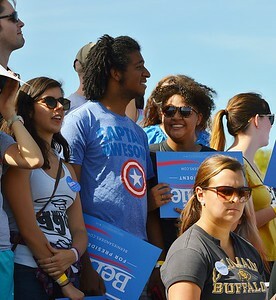 Group of young Bernie Sanders supporters, some with signs, on African-American man wears "Captian Awesome" t-shirt. 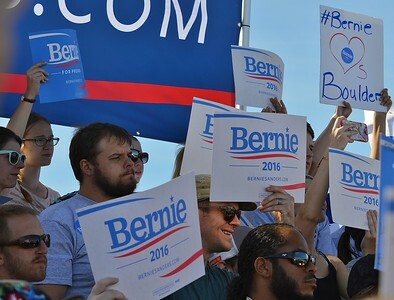 Group of Bernis Sanders supporters with signs. 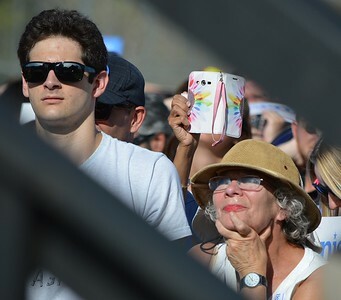 Woman at Bernie Sanders rally listens intently to speech. 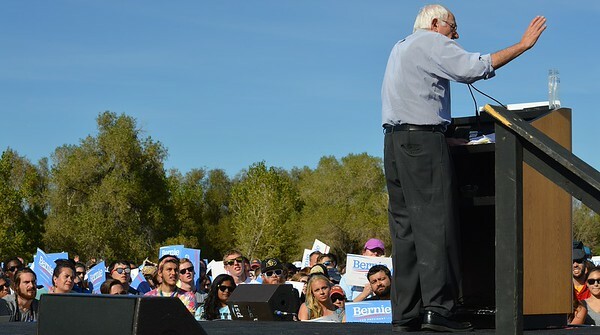 Senator Bernie Sanders, seen from behind, speaks at a campaign rally, large crowd of supporters to his left, raise signs in the air. 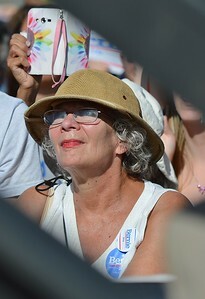 Woman wearing "Nurses For Bernie" t-shirt, watches Sanders, seen from behind, speak at a rally.